Buy Mancala and PriceWatch, Buy this board game at the Lowest Price. Each player "owns" the mancala on his right and the six small bowls closest to him (see Diagram 1). 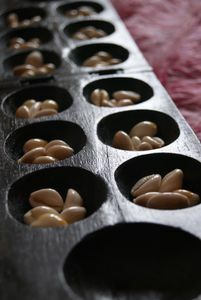 Player 1 starts by scooping up all the stones from one of his small bowls (players may never start from a mancala or from the opponent's six bowls). Player 1 drops one stone into the next bowl on the right, one stone into the second bowl on the right, continuing around the board (counterclockwise) until he has no more stones in his hand. If Player 1 reaches his own mancala, he drops a stone into it. Players do not drop stones into their opponents' mancalas, they skip them and continue dropping stones, one at a time, from their hand until they run out of stones. Players take turns moving. At the end of the game, players count the stones in their mancalas - the player with the most stones wins. If a player drops the last stone from his hand into his mancala, he gets to move again. If a player drops the last stone into one of the empty bowls on his side of the board, he takes that stone, plus all the stones in the opponent's bowl directly across from his bowl and places them in his mancala. The game ends when one player no longer has stones in his small bowls. The other player (who still has stones on his side) places all remaining stones into his own mancala (it is not necessarily an advantage to be the first player to empty the six bowls). Players may choose to move either to the right or to the left on each turn. Players may never start from a bowl with only one stone. Note: I cannot answer questions about this game! The Ethiopian Rules seem popular but don't ask me! When a player drops the last stone from his hand into a bowl on either side of the board that is not empty and does not now (after dropping the stone) have 4 stones, that player picks up all the stones from the last bowl a stone was dropped into and continues play. A player's turn is over when he drops the last stone from his hand into: 1. a mancala; 2. an empty bowl; or 3. a bowl that now (after dropping the stone) has 4 stones. Any time during a move that a bowl has 4 stones, regardless of who dropped the fourth stone into the bowl, the player who owns that bowl puts these stones into his own mancala (in 3. above, the player puts these stones into his mancala before ending his turn). For example, while Player 1 is dropping stones into the small bowls on Player 2's side, he drops a stone into a bowl that already has 3 stones. Player 2 picks up the 4 stones and puts them into his own mancala. The game ends when one player cannot move (no stones remain in that player's six bowls). The remaining stones on the other player's side are not placed in a mancala, and are not counted in determining a winner.